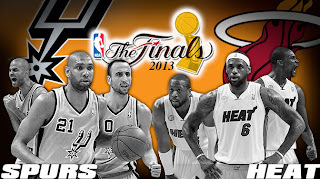 Home BASKETBALL CHAMPIONSHIP LEBRON JAMES MANU GINOBILI MIAMI HEAT MIKE MILLER NBA RAY ALLEN SAN ANTONIO SPURS SPORTS TIM DUNCAN TONY PARKER NBA Finals 2013 Game 6 Spurs vs Heat Live: Will Spurs win championship or Miami Heat force Game 7? 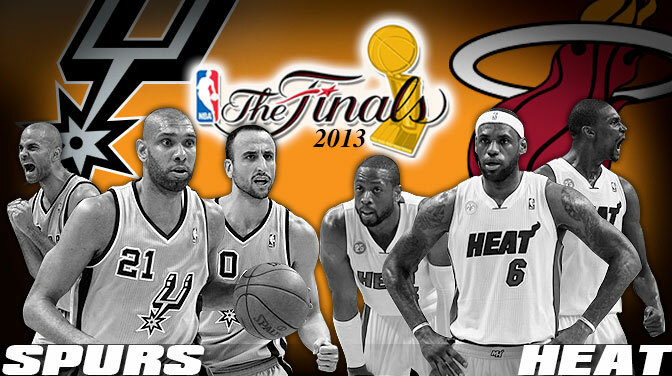 NBA Finals 2013 Game 6 Spurs vs Heat Live: Will Spurs win championship or Miami Heat force Game 7? Two scenarios could happen after Game 6 of the NBA Finals 2013: the San Antonio Spurs winning the 2013 NBA Championship title or the Miami Heat will force a Game 7. On which side are you? Scroll down for the live updates of Game 6. After 3 successive games at San Antonio Spurs' homecourt (Spurs won 2 out of 3), Game 6 is back to Miami Heat's homecourt American Airlines Arena Tuesday night, June 18, (Wednesday morning, June 19, MLA Time). In the 1st quarter and early part of the 2nd Quarter, the Heat were the ones leading most of the time, but by a slim margin. However, at 4:31 of the 2nd quarter until halftime, their scores were stuck at 44 and the Spurs now leading by a 6-point margin as of half-time, 50-44. Unlike his breakout performance in Game 5, Spurs' Manu Ginobili wasn't that impressive this Game 6. He had lots of bad passes and misses in the scoring, that 2 minutes before halftime, he's still scoreless. It's Tim Duncan who's doing most of the scoring so far for the Spurs, reaching 20+ points at 3:31 of the 2nd Quarter, while the rest of the team have below 10 points. Miami Heat meanwhile looked like they're still warming up in the 1st half. I'm expecting more from them this Game 6. As of halftime, Tin Duncan already has 25 points with 8 rebounds, and Kawhi Leonard has 10. On the other side, Lebron James has only scored 9 so far, Mario Chalmers has 14. In the 3rd quarter, Manu Ginobili finally hit the basket, a 3-point shot, at 11:42, and put the Spurs on a 9-point lead, 53-44. At 4:31, Tim Duncan has hit 30 points, with 12 rebounds. This marks only the first time that Duncan scored 30+ in the 2013 NBA Playoffs, and also the first time in his last 26 games. Spurs' largest lead was 13 points, 71-58, 3:49 minutes remaining in the 3rd quarter. 4th quarter already started and someone from Miami Heat finally hit the 20s. At 11:41, Mario Chalmers made a 3-point shot to make his score tally of 20 points. The Heat's momentum finally arrives. After Lebron made 2 dunks and 3 layups, Mike Miller scored a 3 and Chris Andersen hit 1 of his 2 free throws, scores were tied at 82, 6:34 minutes left. And the Heat finally back on the lead, 82-84, after Ray Allen scored his first 2-point shot at 6:03. Lebron already has 27 points, 7 rebounds and 9 assists as of 4:45 in the last quarter. The last 2 minutes of the game turned out to be the most exciting of all when scores were tied at 1:27 and Spurs took the lead again with 58 seconds remaining, 91-89. And the lead further increased to 5, 94-89, after a 3 out of 4 free throws by Ginobili, 28 seconds left. Lebron trimmed down the lead to just 2 when he made a 3-point shot, with only 20 seconds remaining. He now has a total of 30 points. And 4th quarter ended with 95 all to force a 5-minute overtime (after 1 free throw by Spurs' Kawhi Leonard and a 3-point shot by Heat's Ray Allen). At 4:26: Spurs' Kawhi Leonard makes a layup, 97-95. At 3:32: Heat's Chris Bosh answers also with a layup, 97-97. At 3:08: Leonard hits the basket again, this time a jump shot. 99-97. At 2:42: Parket hits 1 of 2 free throws, 100-97. At 2:29: A jumper from Ray Allen, 100-99. At 1:43: Lebron James adds another 2-point shot to put Heat back on the lead, 100-101. He's just 1 rebound away from having a triple double (32 points, 9 rebounds and 11 assists). At 2:03: It's a triple double for Lebron James: 32 points, 10 rebounds and 11 assists. At 0:01: Ray Allen hits 2 free throws, 100-103, and that secured Miami's win to tie series, 3-3, and push a Game 7 on June 20 at the American Airlines Arena (June 21 Philippine Time). Game 1 - Spurs win, 92-88, lead series 1-0. Game 2 - Heat win, 84-103. Series tied 1-1. Game 3 - Spurs win, 77-113, lead series 2-1. Game 4 - Heat win, 109-93. Series tied 2-2. Game 5 - Spurs win, 104-114, lead series 3-2. Game 6 - Heat win, 100-103. Series tied 3-3. Watch the latest 'Turbo' trailer!